It is the time of the year where growers are getting ready to prepare cotton land by burning down winter weeds in wheat/rye/oats cover crop. Cover cropping is widely used to help reduce weed emergence, preserve soil moisture, help with thrips, etc. 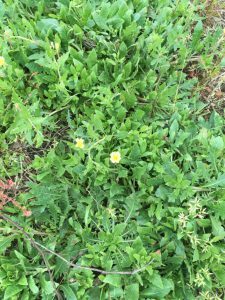 Two of the most common winter weeds I see are wild radish and cutleaf evening primrose as pictured below and are typically harder to control in reduced-till. The most effective and economical herbicide options, especially for strip-till cotton and for these two weeds are 2,4-D, mixed with a Roundup and Valor combination at least 30 days before planting. Dr. Culpepper discusses in the cotton production guide, the 2,4-D rates for each weed. 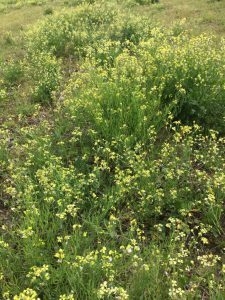 For primrose, 2,4-D at 8 to 12 oz/A of a 3.8 lb/gal formulation is sufficient and would reduce the interval between application and planting non-Enlist cotton cultivars; however, rates of 1.0 to 1.5 pt/A are needed for wild radish. Valor is recommended as a tank mix partner because of improved primrose and radish control, as well as residual that will help against pigweed in cotton. Always follow the plant back intervals according to the labels, and there is a Georgia 24c Valor label that allows reduced plant back intervals.